City leaders approved a ban on plastic grocery bags after weeks of lobbying on both sides from environmentalists and a supermarket trade group. If Mayor Gavin Newsom signs the ban as expected, San Francisco would be the first U.S. city to adopt such a rule. The law, passed by a 10-1 vote, requires large markets and drug stores to give customers only a choice among bags made of paper that can be recycled, plastic that breaks down easily enough to be made into compost, or reusable cloth. 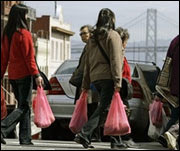 San Francisco supervisors and supporters said that by banning the petroleum-based sacks, blamed for littering streets and choking marine life, the measure would go a long way toward helping the city earn its green stripes. Newsom supported the measure. The switch is scheduled to take effect in six months for grocery stores and in one year for pharmacies. Craig Noble, a spokesman for the Natural Resources Defense Council, said it would be disappointing if grocers rejected the biodegradable plastic bag option, since more trees would have to be cut down if paper bag use increases. The new breed of bags "offers consumers a way out of a false choice, a way out of the paper or plastic dilemma," Noble said.